After a large cooked breakfast, I set off from Brechin just before 9am for the half-day walk to the coast in the sunshine. 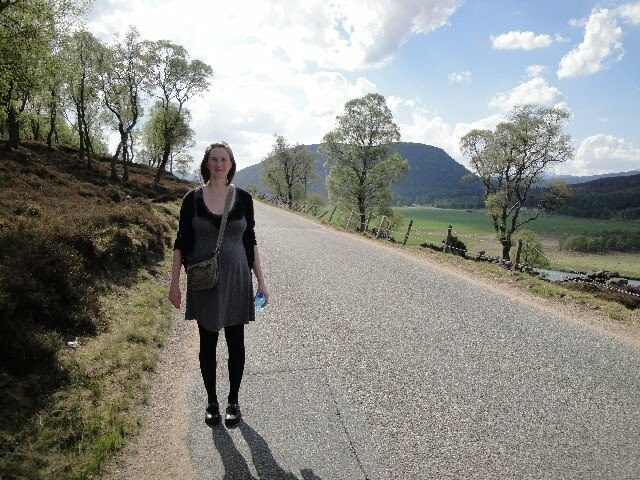 Most of the walk was along roads, which was tedious. However a few km were across Rossie Moor, which were along pleasant paths. However not all the paths shown on the map actually existed, which made for some interesting navigation. 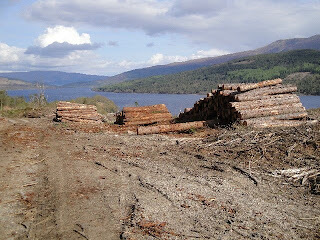 If only the OS marked rights of way on maps of Scotland! 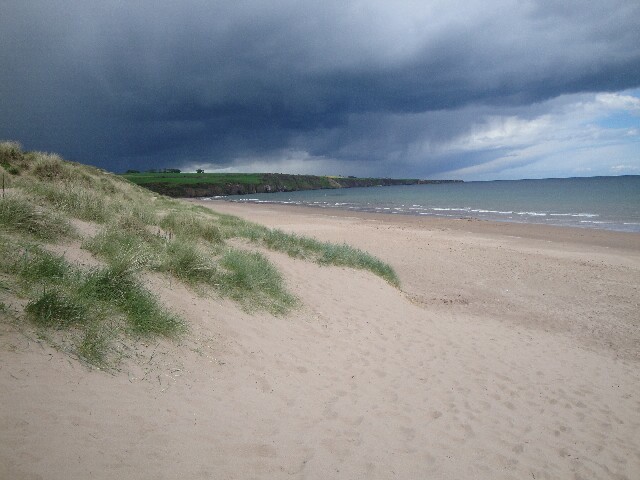 I arrived at Lunan Bay shortly after midday, where Lynsey was waiting for me. After dipping my feet in the North Sea, we headed to the car for lunch. Just as we got into the car there was a torrential downpour; clearly I had finished just in time! It had been a good third crossing, although it was a bit strange walking without Lynsey. My final day's walking should only take a few hours and I hope to reach Lunan Bay in time for lunch. After a late night last night and hearing warnings of peat hags and electric fences without crossing points, I decided to give the Hill of Wirren a miss. Instead I headed south through the Clash of Wirren, which was a gap in the hills, although not as impressive as the map suggests. 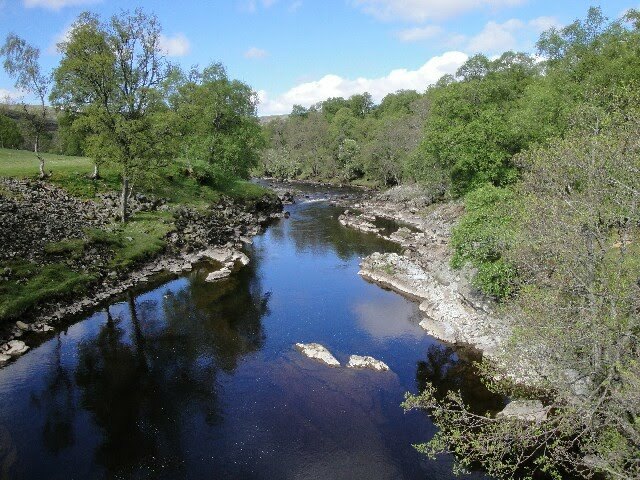 I dropped down to meet the minor road that runs alongside the West Water, which I followed for just over an hour. It was starting to rain as I ascended up the road to the Caterthun hill forts. By the time I reached the top of the White Caterthun, it was hailing heavily. I plodded along the road to Brechin in the pouring rain, whilst listening to music to relieve the tedium of road walking. 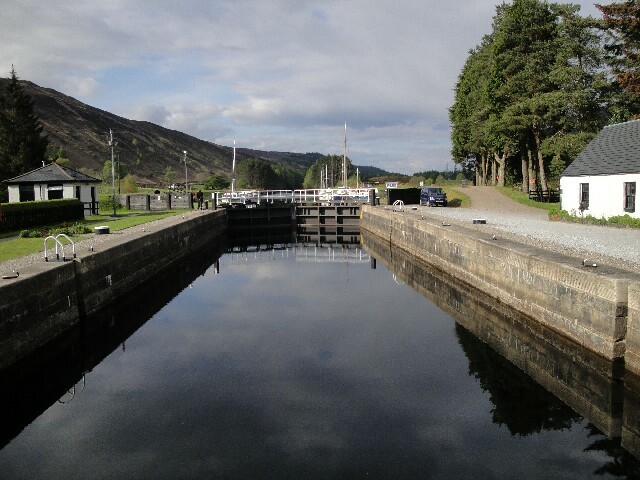 I reached Brechin at 4:30, where I met up with Lynsey again. It rained most of the evening and I was glad to be staying inside this evening! 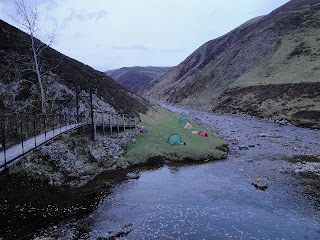 The last two years Lynsey and I have walked from Tarfside down the valley to the campsite at North Water Bridge. This year I've decided to take a different route out of Tarfside via the Clash of Wirren and then on to Brechin where I'll be meeting up with Lynsey again. 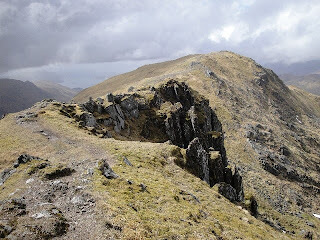 If the weather is good then I plan to bag the most easterly Munro, Mount Keen, this morning and then head on to Tarfside. As I write this, the cheese & wine party by the side of the Water of Unich has just drawn to a close and we've all retired to our tents due to the cold evening. Thanks to Alan & Phil for the invite; it was an excellent evening. I was glad that I decided to alter my route to include it! I set off from Braemar shortly after 9am and followed the minor road south. After walking for 3km, I was relieved to discover that the footbridge marked on the map did actually exist! Lynsey was waiting for me at the bottom of the track up to Loch Callater, which was a nice surprise. After saying goodbye again, I headed up to Lochcallater Lodge for tea. 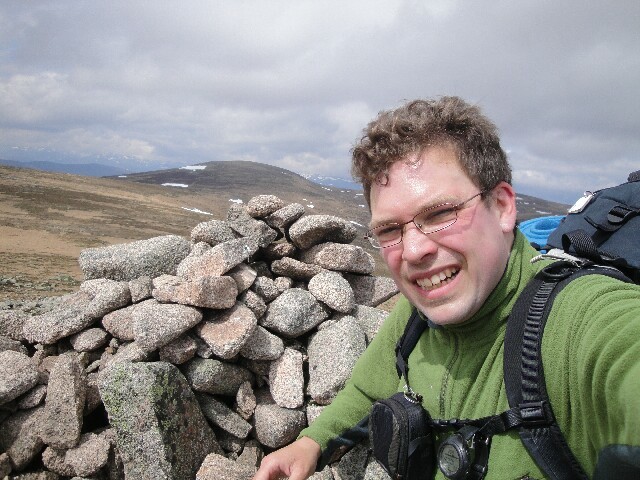 The weather improved as I climbed away from Loch Callater to Cairn Bannoch and then onto Broad Cairn. 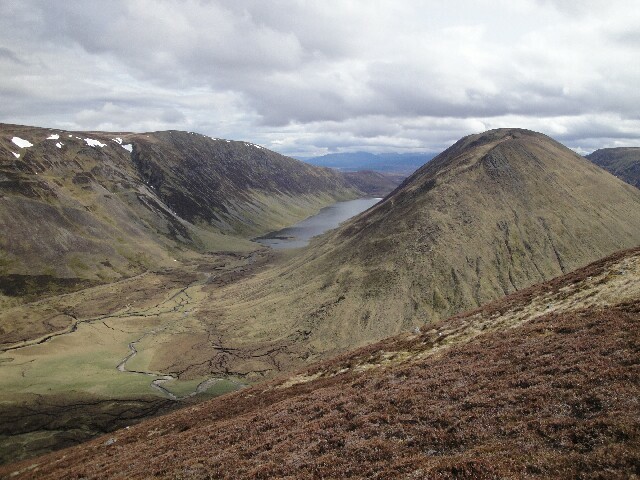 The views across to Lochnagar were excellent. At the estate hut east of Broad Cairn I met a group of challengers who had set off from Lochcallater Lodge this morning: John, Mick, Peter & Gerry. They too were heading for the cheese & wine, so I spent the rest of the afternoon walking with them over the rough ground riddled with peat hags. 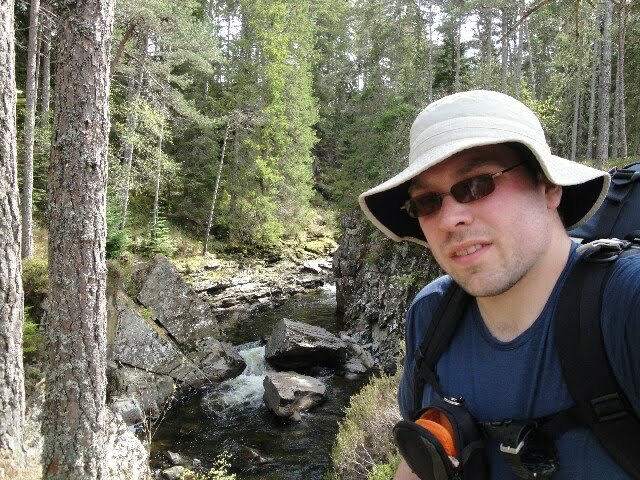 We reached the headwaters of the Water of Unich just after 7pm. After 15 minutes walking, we were relieved to find a group of tents; they had stopped a couple of km short. I pitched my tent, had a cup of tea and took my Argentinian Shiraz & Wensleydale with Cranberries over to join the party. 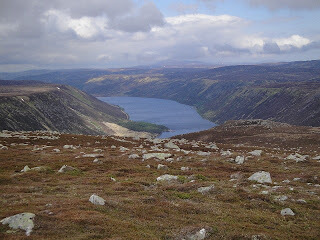 This morning I plan to walk to Lochcallater Lodge, where I'll drop in for tea, before heading up into the hills again and I'm aiming to camp somewhere near the headwaters of the Mark. 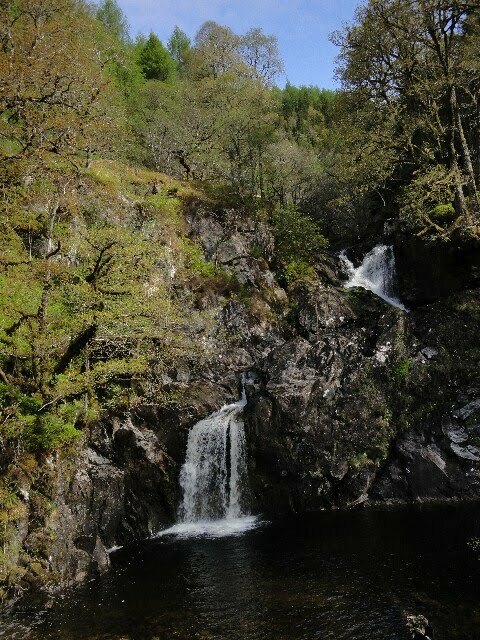 I set off from the Falls of Tarf just before 9 on another scorching day, with not a cloud in the sky. I followed the path towards Fealar Lodge, before cutting up through heather to reach a welcome stream to resupply with water. I stuck to the higher ground, occasionally following faint paths, as I ascended the west top of Carn Bhac. As I walked across to the true summit, the views across to the Cairngorm plateau showed that there was still plenty of snow up high. 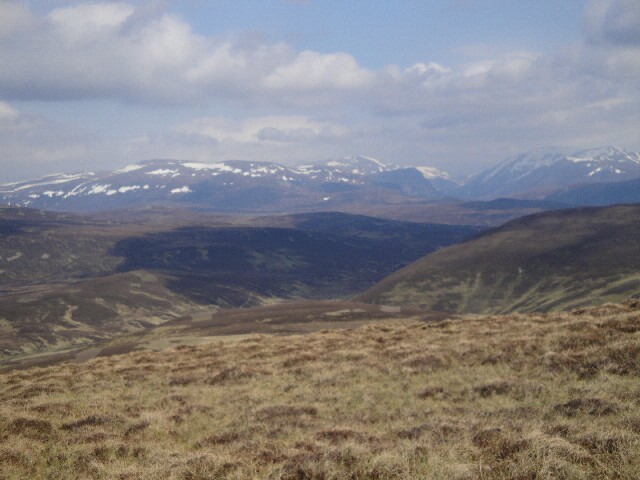 I had lunch in the cooler air on the summit before desending north-east to Inverey, where I joined the road to Braemar. It was a boring walk along the baking hot road for the first hour of so. Then I met Lynsey, who had walked out of Braemar to meet me, which was a nice surprise! After another Munro this morning, I plan to drop down to Braemar where I'll be meeting Lynsey for the first time on my walk and will also be taking a rest day. 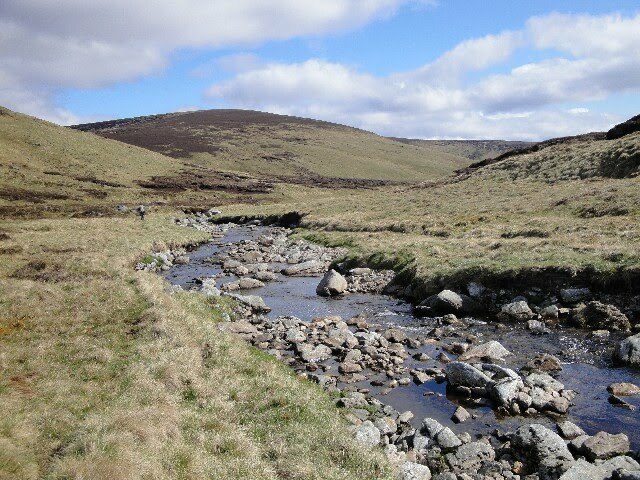 Today should be a good walk along parts of the Tarf and Tilt with a hopefully a hill in-between. I plan to camp at the Falls of Tarf. 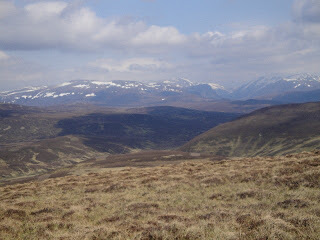 I should be crossing the A9 this morning and then climbing two Munros before heading east to Glen Bruar. Today looked to be an easy, but long, day, but somehow it didn't turn out that way! John, Andrew & I left Melgarve just after 8:30 for the road walk to Garva Bridge and the day was already quite hot. 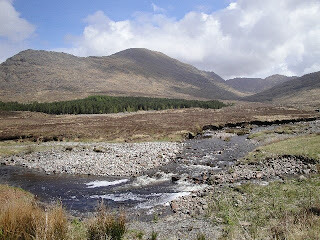 After a few more km along the road, we headed S along a landrover track to the A86. The map looked to show a shortcut that cut off some of the road, but after following a track for 5 minutes, we ended up outside the garden of a big estate house. The woman who was tending the garden kindly let us through so we didn't have to walk all the way round! 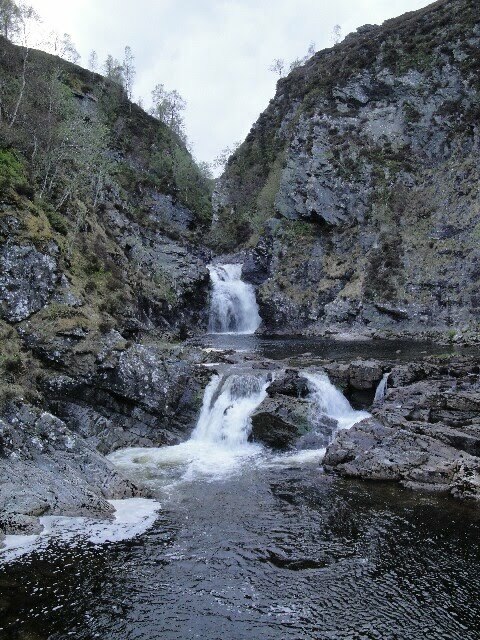 We found a lovely spot to spot and dip our feet in the River Pattack to cool off, just by some waterfalls. The first hour or so from here went well along good forest tracks. 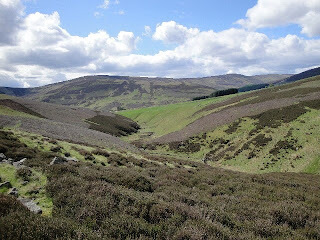 However they eventually ran out and we picked our way across the open moorland. When we eventually reached the road near Dalwhinnie there was a handy sign informing us that the right of way we had just followed was not evenident on the ground, which by that time we had already worked out! 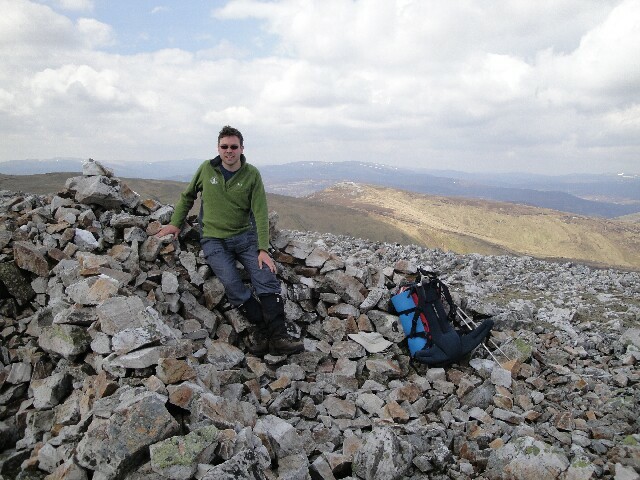 Another long day today, hopefully including a couple of Munros before finishing in Dalwhinnie. I was feeling very tired this morning after the previous two long days, and the weather forecast didn't look to be good for tomorrow, so I decided against my plan for a high camp. 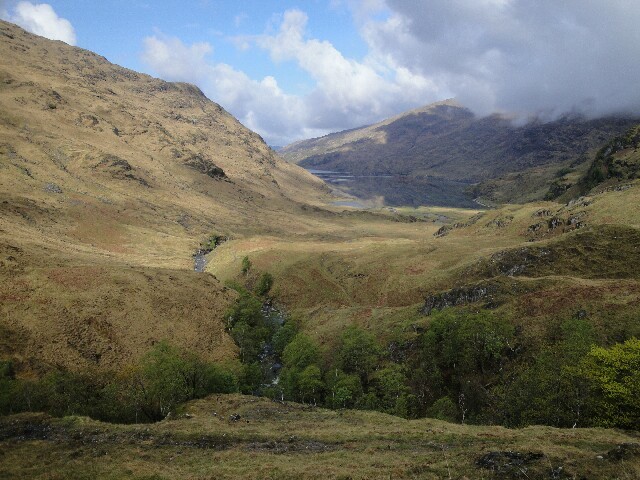 Instead I decided to head to Melgarve bothy via Glen Roy. 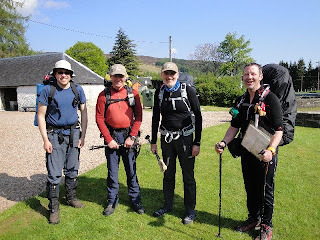 I set off from the hostel with John, Andrew, Alan & Phil at 10am for the climb up the 'Fairy Glen'. We had been given instructions from the hostel regarding the best way out of the forest, which we followed. 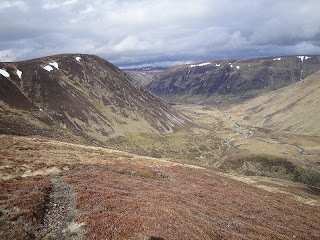 The faint path petered out above the forest, so it was then a rough walk across to Glen Turret. 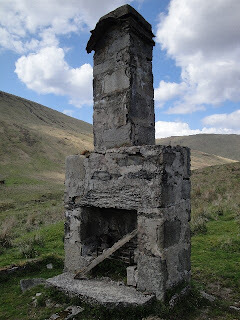 In Glen Turret we found the remains of two ruined shepherd's huts, with only the fireplaces & chimneys remaining; one of them even had a saucepan & kettle by the fire! We had a lovely sunny afternoon walk up Glen Roy, stopping for some long breaks for brews in the sunshine. Alan & Phil stopped at Luib-chonnal, but Andrew, John & I decided to push on to Melgarve. 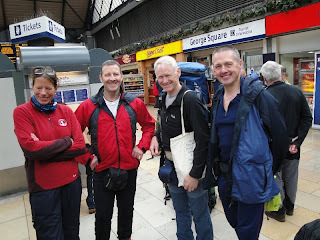 As we neared Melgarve, we met Peter & Avril and then Humphrey. 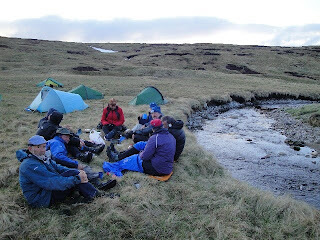 We arrived around 9pm and had dinner & whisky in the last light of the day. Another shorter day today, with no hills planned but ending with a high wild camp near Creag Meagaidh. 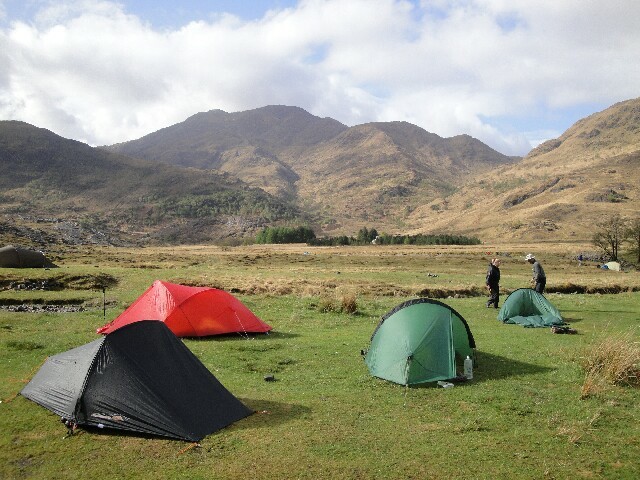 There wasn't a cloud in the sky when I got out of the tent this morning. I set off walking up past the Eas Chia-aig waterfalls at 9am. The going was easy for the first hour and a half along the forest tracks. 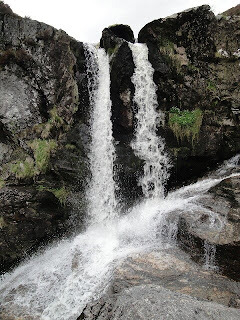 The ground was then quite rough all the way up to the Cam Bealach, which I reached at 12:30 for lunch. Leaving all my camping stuff hidden behind a boulder in the bealach, I nipped up the two munros: Meall na Teanga and Sron a Choire Ghairbh. It drizzled intermittently on the way up to the summits, but luckily the cloud stayed high enough to ensure I had some good views from the tops. I reached the forest track above Loch Lochy at 5ish, then the hostel at 6:30ish where I met Peter & Avril. John, Andrew, Alan & Phil arrived somewhat later having been waylaid by the floating pub. 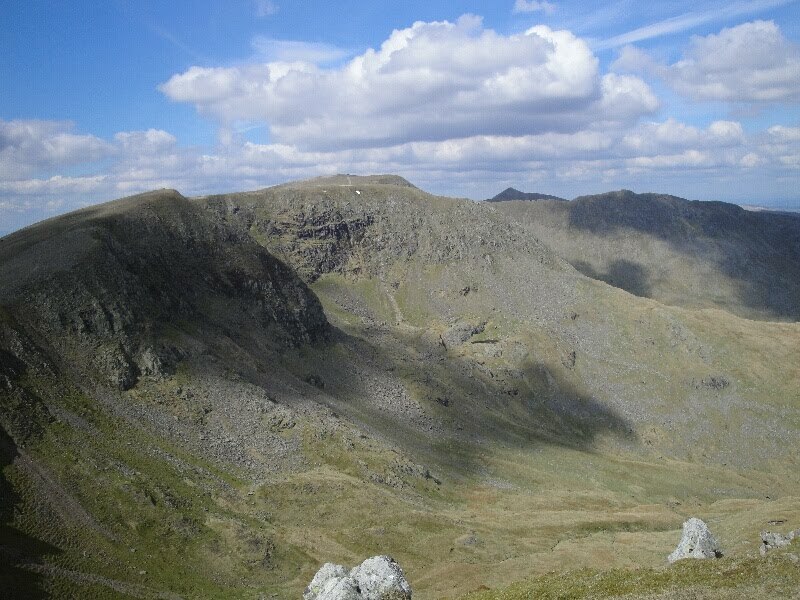 A shorter day today, mainly through forest but I should hopefully be able to include an ascent of Ben Tee. After spending my third night on the west coast (this time at Sourlies), I decided that it was time I actually made some eastward progress! It was sunny when I left Sourlies at 8am, and the loch was still enough to give a fantastic reflection of the mountains. 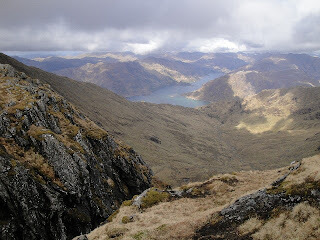 The going was rough again in places on the way up the Màm na Cloich Airde. At the top of the pass, I got my maps out and had a good look at the route ahead. 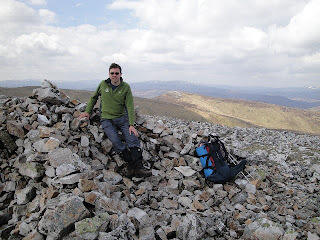 My plan was to head over to Glen Kingie to climb two more Munros and then head east to Tomdoun. However, due to the time and the distance left to go, this was now looking somewhat unlikely. 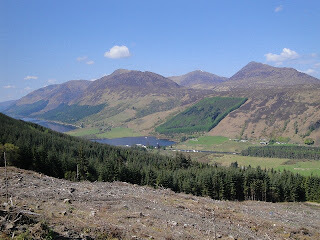 I therefore decided to forgo the Munros today and instead I planned to head east along the length of Loch Arkaig, with the option of climbing the Munros above Loch Lochy tomorrow. Therefore to monitor my progress today & tomorrow, you'll have to zoom out on the maps of my planned route. I made it to A'Chùil bothy in Glen Dessarry just as it started to rain. I had lunch inside in the dry, whilst the shower passed. I continued east along the forest track to reach the end of the public road; now I had 20km of tarmac and forest tracks to look forward to! I woke up to the sound of rain on the tent, which resulted in me having a leisurely start to the day. However, by the time I left Barrisdale at 09:30, it was dry and sunny. 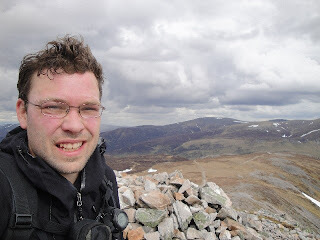 It was very windy on the ascent of Luinne Bheinn and I reached the summit just before one. 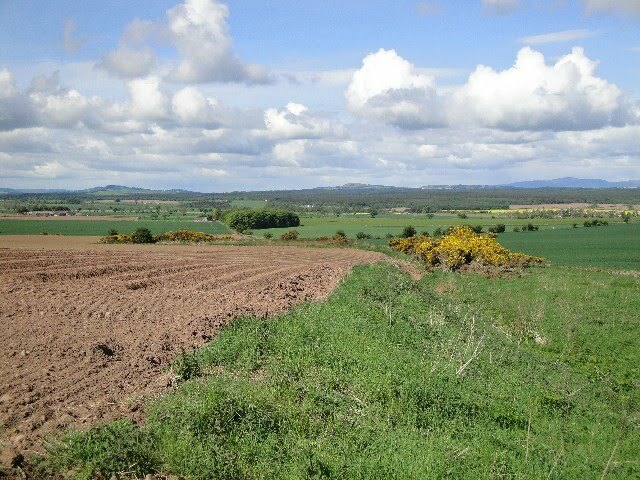 The views were excellent and it looked like it had snowed last night on the hills further north. The ground was quite rough it places and I made relatively slow progress around the top of Choire Odhair to Meall Buidhe. 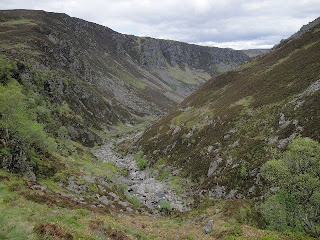 The coire looked quite impressive and was filled with glaciated slabs. 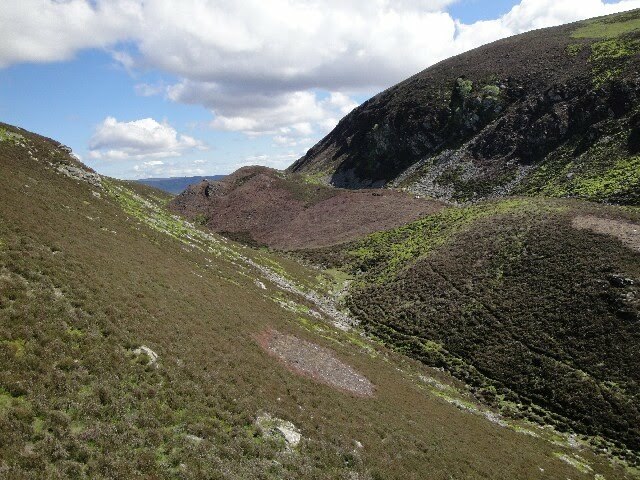 Descending down to Mam Meadail was quite slow going as I picked a way down through the crags. The stalkers path provided easy going down to Carnoch, where I crossed the notorious rickerty footbridge. Sourlies bothy was reached by a scramble around the bottom of the headland as the tide was now too far in to walk along the shore. It had been a tough day so I decided to stop for the night at Sourlies, which is a lovely spot at the head of Loch Nevis. Hopefully tomorrow will be easier going. Assuming that the weather isn't bad, today's plan is to bag my two remaining Munros in Knoydart: Luinne Bheinn and Meall Buidhe. 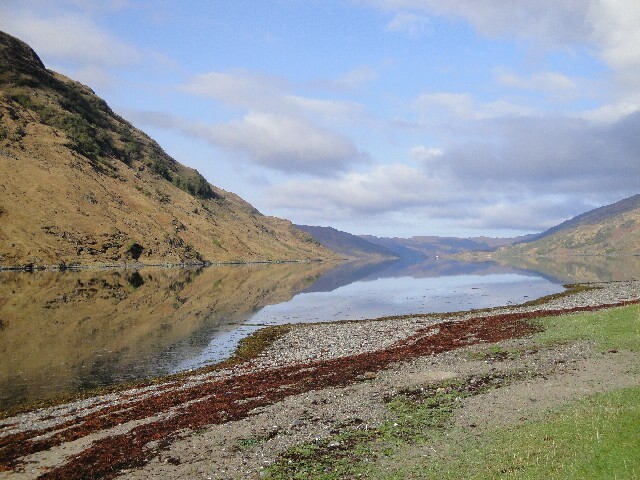 After that I intend to drop back down to sea level at the head of Loch Nevis and then head east into upper Glen Dessarry. 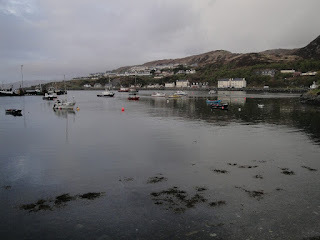 Starting from Inverie meant that I had a much more leisurely first morning than in previous years as the boat doesn't leave Mallaig until 10:15. The boat was full of challengers and their backpacks, together with various assorted items for the villagers in Inverie because the boat is the mail boat. 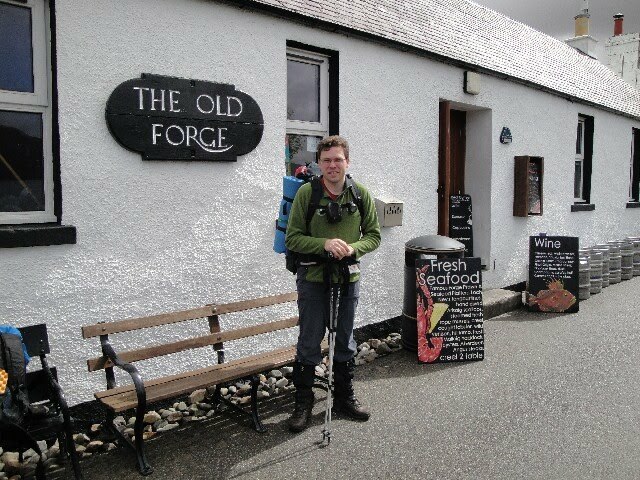 I popped into the Old Forge for a quick drink with the majority of the other challengers. I left Inverie on my own at midday and headed north to Gleann na Guiserein. Everyone else was heading for Barrisdale or Sourlies. 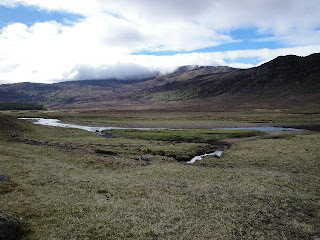 The cloud started to lift above the summits as I started to climb Ladhar Bheinn. Unfortuantly by the time I got to the summit it was in the cloud again. 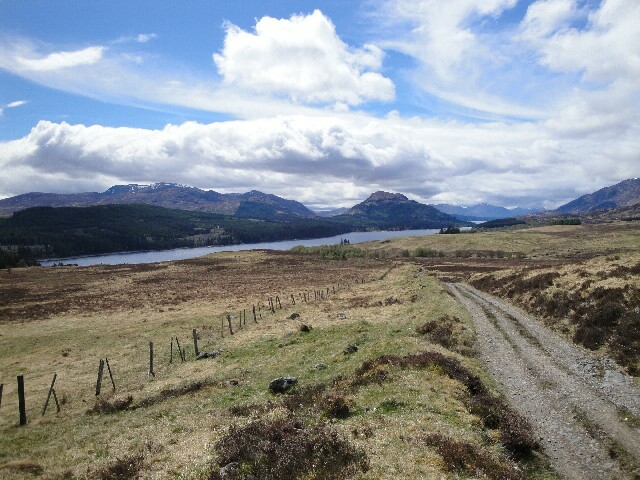 Nevertheless, on the way up I got excellent views over the neighbouring hills and over to Skye & Eigg. The SE ridge of Ladhar Bheinn turned out to be quite rocky, with several scrambly down-climbs, which therefore took a while to descend. After ascending over another peak, I dropped down to Mam Barrisdale where the plan was to camp for the night. However it was quite windy so I instead chose to descend to Barrisdale to camp. I arrived at Barrisdale around 8 ish and found several other challengers also camped there, including Dennis, Lou & Phyllis and Jeff & Joke. 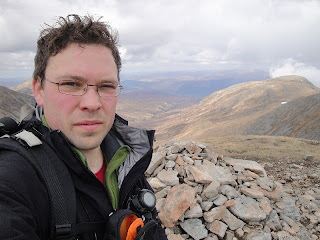 The plan for my first day is to take the morning ferry from Mallaig across to Inverie and then head up Ladhar Bheinn, before dropping down to camp at Mam Barrisdale. Lynsey dropped me off at Stockport station at 7am for my 10.5 hour journey to Mallaig. 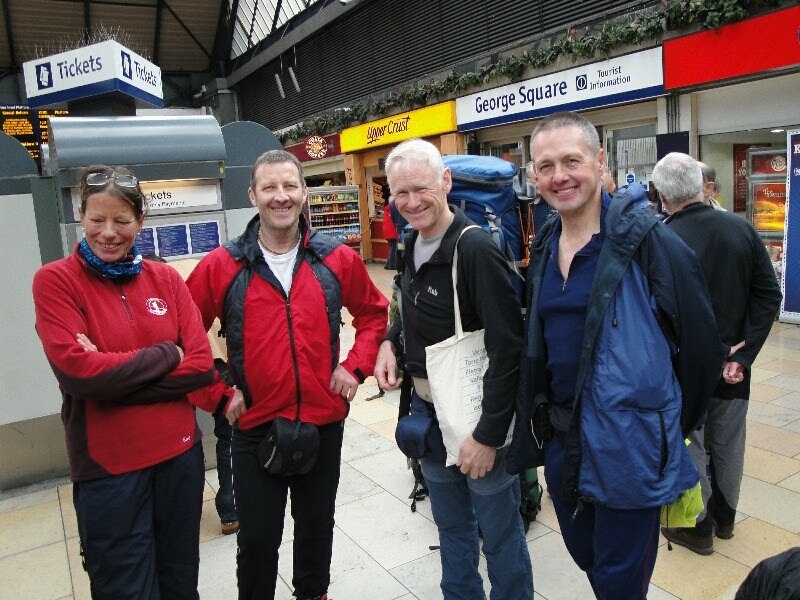 I met the first challengers when I changed trains at Carlisle. The gathering at Glasgow Queen St was impressive, having managed to miss out on this the last 2 years. 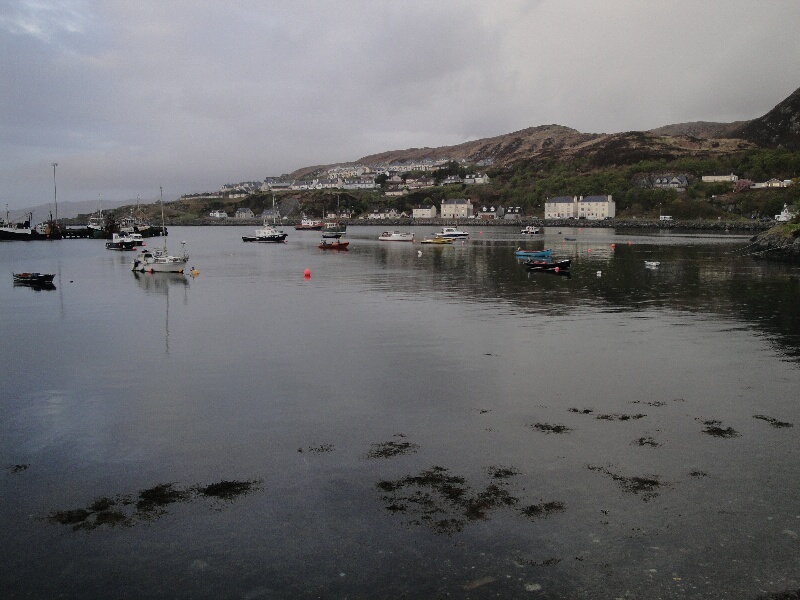 The journey to Mallaig was excellent with good views and company. Fish & chips for dinner followed by a couple of pints of Red Cuillin in the West Highland Hotel. 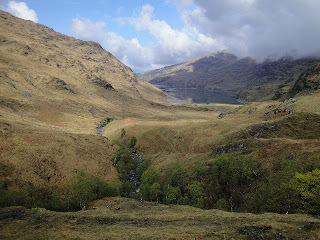 I leave home tomorrow to take the train up to Mallaig for the TGO Challenge. 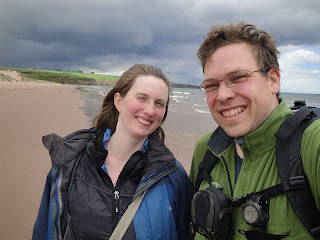 I will be updating my blog, with photos and comments, hopefully daily (but it depends on phone signal). I will also be using the ViewRanger software on my mobile phone to provide updates on my position. This blog should automatically display a map with my planned route on every morning, together with a link that will open an OS map in a new window that should display my recent positions together with my planned route. Thank you to Jim for kindly hosting my files and also thanks to those who had made some helpful postings on the OS OpenSpace forum. It was howling a gale, but sunny, when I parked in Patterdale, so I was somewhat apprehensive about what the wind would be like up high. As soon as I started walking up Grizedale the wind died down and it stayed calm as I climbed up Birkhouse Moor. 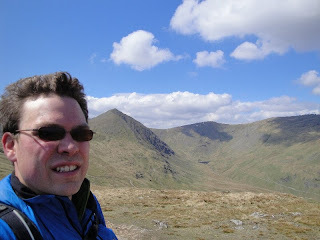 There were excellent views over Ullswater from the top of Birkhouse Moor and Striding Edge beckonned me onwards. 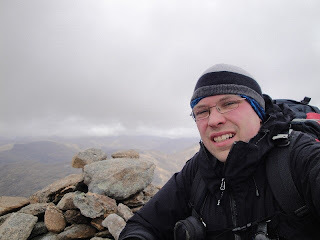 It was a bit blustery along Striding Edge, but not enough to cause me a problem whilst walking along the crest. The summit of Helvellyn was surprisingly busy for a Friday, and unlike the majority of my visits I actually had a view today! 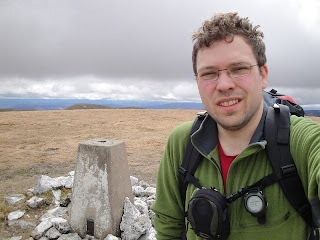 I continued over the summits Nethermost Pike and Dolywaggon Pike before dropping down to Grizedale Tarn. It clouded over as I headed up St Sunday Crag and then descended back down to Patterdale.